The Grand Rapids Press reports that Kent County Animal Control received a call about a tiger in the driveway of a vacant Grand Rapids home. Supervisor Joe Dainelis responded to the call, and when he spotted the animal, he grabbed his safety gear. Neighbors also thought the life-sized, furry toy was real. But when Dainelis' co-worker, Rachel Jensen, approached from another direction, she realized there was nothing ferocious about the toy feline. Where he lives there are tigers so he thought is was a tiger which is ok I would have to. I'm glad is wasn't real or a mother would have been come looking for it. I laughed a lot with this one, i can imagine the fear that felt the poor man and his reaction when he saw that the animal wasn't real. The people that lived there thought that the animal was real, so he didn't suspected that the animal wasn't real, also it was a real-sized tiger so it was easy to think that it was real. 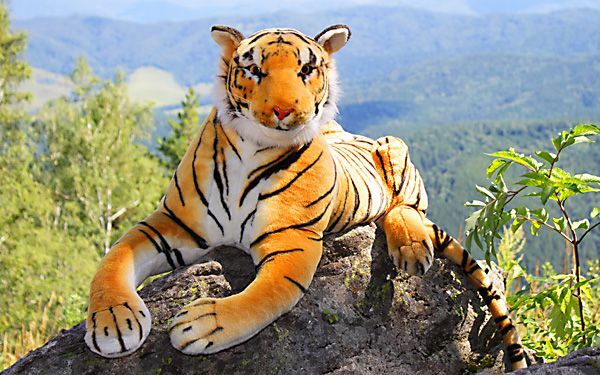 I think that it is silly for people to actually believe that the toy stuffed tiger doll was actually a real tiger. 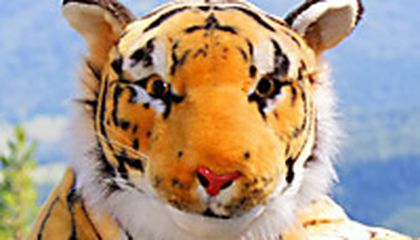 Some people have been fooled and will probably think that "how could I have not known that it was a stuffed animal instead of a real tiger." People actually grabbed their safety gear because they thought the stuffed tiger was real. Great joke, but really a toy. Dress somebody up as a tiger so they believe it longer. But I wouldn't use a real tiger that would be a bad joke.